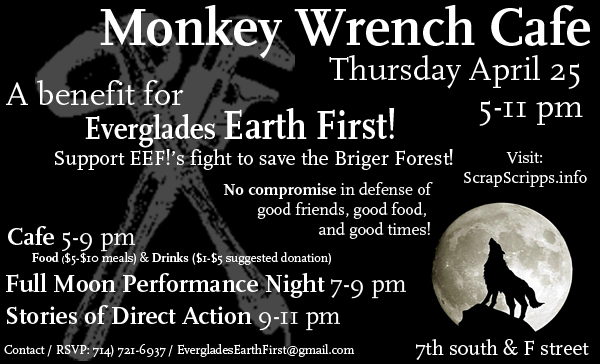 Full Moon Performance Night and Monkey Wrench Cafe to Benefit EEF! for the Briger Forest! Why: A benefit for Everglades Earth First! Join us for April’s Full Moon Performance night and Monkey Wrench Cafe! The night will begin with a delicious dinner and drinks being served starting at 5 pm and running until 9 pm or till we run out of food. At 7 pm we will move into the Full Moon Performances and as the full moon rises in the sky we will reclaim the true spirit of a traditional Monkey Wrench Cafe by sharing inspiring stories of direct action around a camp fire. This event will benefit Everglades Earth First – your local no compromise environmental group that is working to defend the Briger Forest in Palm Beach Gardens from being “developed” into a biotech facility with accompanying suburban sprawl. EFF! is determined not to let this happen to the largest undeveloped tract of land from Palm Beach County to Miami-Dade and east of I-95. Performances of all kinds are welcome! Home Demo against Primate Products’ John Resuta gets under his skin! On Sunday, April 14th, folks from Everglades Earth First! joined South FL Smash Huntington Life Sciences’ (Smash HLS) demonstration outside of John Resuta’s empty suburban home. John is the Operations Manager at Primate Products in the Live Animal Division located in Doral. As a higher up who profits off of the selling of primates, he is not well liked. The protest, scheduled from 6-8, ended as it usually would…with a chant: You don’t know when, but we’ll be back! And back they were, sooner than expected. After the cops had loong gone, John and Joan his wife, thought they could sneek home without notice. Coming from the far end of the street, John and Joan’s car’s were greeted with chants, frustration, anger and questions. “How can you sleep at night? !”, one of them demanded to know. He was accused of nothing less than the cruelty of transporting primates to a future of long torture and ultimate death. What is the connection between Scripps Research Institute and Primate Products? Primate Products is a distributor of Primates based in South Florida. According to the Animal Rights Foundation of Florida, Scripps is the largest private research Institution in the U.S., and in Florida is one of the largest animal research facilities in the state. In their facility in Lajolla, CA they test on primates, and have a record of mistreatment including forced drug abuse and malnourishment. Visit ARFF to read more. As far as we know, the Scripps Phase I facility is not set up to test on primates, but they have full intention of doing vivisection on primates if Phase II opens up in the Briger Forest. And Primate Products will be their closest primate distributor. Animals, should not be vivisected, tortured for the use of scientific experimentation that almost always end in their death, and the science behind it does not equate to human studies anyways. 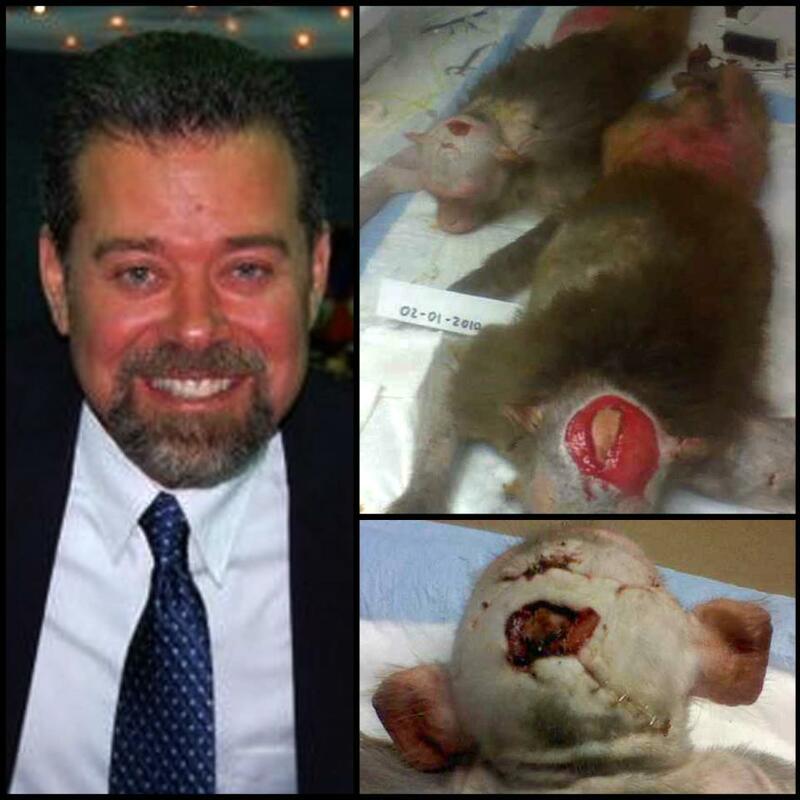 Scripps: Drop the vivisection! And Primate Products; may you go out of business.